One aspect of quantum particles is that they can decay into lighter particles, releasing energy. For example, a free neutron will tend to decay into a proton, electron, and anti-neutrino. Most particles undergo this kind of decay. Some decay rather quickly, while others tend to take longer to decay. There are a few particles, however, that don’t decay. The electron is stable, as is the lightest neutrino. Then there is the proton, which might be stable, but we’re not entirely sure why. The periodic table of fundamental particles. The proton is the lightest of the baryons (meaning that it is made of three quarks), while he electron and neutrinos are leptons. According to the standard model, the quarks are governed by the strong nuclear force, while the leptons are governed by the electroweak force (which is a unification of electromagnetism and the weak nuclear force). Because these two forces are separate in the standard model, there is no way for a proton to decay into lighter particles. There are quark particles, known as mesons, which are lighter than the proton, but these consist of a quark-antiquark pair rather than three quarks. In order for a proton to decay into a meson and other particles, there would need to be a way for one of the quarks to decay into a lepton, which isn’t possible under the standard model. So in the standard model, protons are stable. The standard model is the scientific theory of particle physics, and it works extremely well. It describes how everything but gravity works, and experiments have repeatedly validated it, most recently with the discovery of the Higgs boson. But it is often viewed as an incomplete theory because it doesn’t provide a unified structure connecting the electroweak and strong forces. For that you would need a grand unified theory or GUT. We don’t know if such a GUT exists. It’s possible that there is no unified physical theory, but it’s generally thought that the electroweak and strong forces do unify to form a GUT, and could even combine with gravity to form a theory of everything. If the electroweak and strong are connected, then it should be possible for protons to decay through some heavy intermediary particle. Thus if a grand unified theory exists, protons shouldn’t be stable. The most basic GUT model predicts that a proton can decay into a pi-meson and positron. 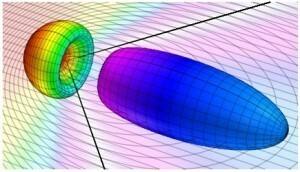 The pi-meson would then quickly decay into a pair of gamma rays. 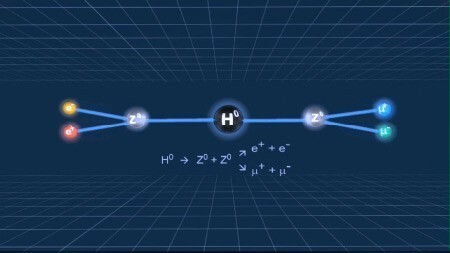 The estimated half-life of the proton is about a billion trillion trillion years, which is vastly longer than the age of the universe. You might argue, then, that the proton is effectively stable, and you’d have a point. But that doesn’t mean that we would never see a proton decay. One of the important aspects of radioactive decay is that it is statistically random, where the half life is the time for which a particle has a 50/50 chance of decaying. Some particles will decay much more quickly, while others will take much longer. There have been experiments testing for proton decay, such as the Super Kameokande neutrino detector in Japan. This detector contains 50,000 tons of purified water being observed by extremely sensitive photodetectors. It’s main experiment is to observe the effects of neutrinos colliding with atomic nuclei, but given its scale and the estimated half-life of protons it should see about 7 proton decays a year. So far it has observed none. As far as we can tell experimentally, the proton is completely stable, and there is no evidence of proton decay. We just aren’t sure why that is.